Kathrin Maedler: persecuted genius or zombie scientist? The prize-winning German pharmacologist and diabetes researcher Kathrin Maedler is regularly in the German and international news, either as a celebrated genius about to cure diabetes or as a potential cheater, responsible for masses of duplicated images in her publications. The rectorate of her own University of Bremen absolved their professor of all suspicions of data manipulations, while admitting image duplications and loss of original data. One argument was that all results were successfully reproduced, yet by whom: that the Bremen rectorate prefers not to answer, together with all other relevant questions which would have made this investigation anywhere credible. In the same vein, another investigation at the University of Zürich in Switzerland, where Maedler did her PhD in 2000-2004 under the supervision of Marc Donath, absolved them both of any suspicion of misconduct as well, while refusing to provide any further explanations. Meanwhile, other labs have refuted Maedler’s discoveries, but these publications were dismissed by the University of Bremen as irrelevant. Maedler also had to retract a publication Ardestani et al 2011 from the Journal of Biological Chemistry (which is known to have a rather tough stance on suspected misconduct). “I would like to inform you, that after 2 years, the investigation at University of Bremen is now closed and an official statement posted. There are no data manipulations nor scientific misconduct. University of Zurich had investigated in parallel and already concluded in Oktober 2015 that no scientific misconduct was identified”. Now, a small circle of German scientists had another look at Maedler publications and found more reasons for data integrity concerns (full dossier available here). Also the award-winning doctoral dissertation of her former student and now junior group leader, Amin Ardestani, is possibly affected. “The DFG is evaluating the Mädler case and intends to issue a statement after the upcoming session of its committees”. Actually, Maedler’s current professorship in Bremen is not fully in place yet: though she is funded by the DFG since 2014 as Heisenberg-professor, she is not yet officially appointed as such. The reason: Heisenberg funding is awarded for 5 years, but the universities must offer a permanent tenure as a follow-up, before the Heisenberg professorship is officially awarded. Exactly this is the problem: the University of Bremen was so far a bit cautious to give Maedler a permanent faculty position. This may be less to do with Maedler’s many image duplications (which University of Bremen doesn’t see as a problem at all), but with the fact that after all the scandals (which included failed clinical trials based on fishy data) she may have difficulties to attract funding. This may present a problem for a permanently tenured professor aged only 45. The signs are there: last year Maedler was nominated to the DFG review board Cell Biology by her University of Bremen (and supported by 3 other German universities! ), but, alas, she was not elected (and neither was her husband, Lutz Mädler). Now it is up to DFG if they want to follow the Bremen and Zürich school of thought. 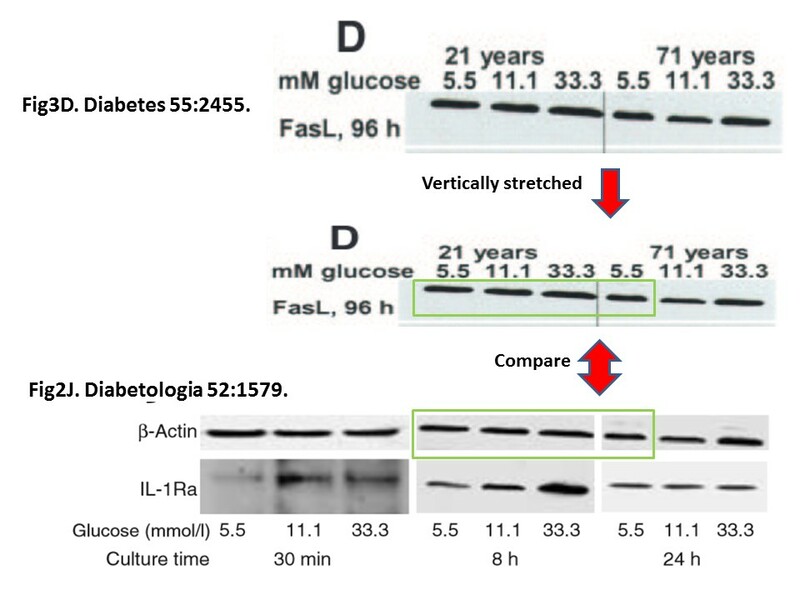 I wrote back asking how to interpret these two cases of suspected band duplications from PubPeer, presented below (Maedler et al, Diabetes, 2006 and Maedler et al, PNAS 2004) . Are those duplicated bands? And did the investigative commission ever request of Donath and Maedler to prove the existence of original research data? “The internal investigation was limited to the 7 papers which Prof. Mädler and Prof. Donath published during their period of employment at the UZH from 2001 to 2006. In our view, there are no new facts concerning the manipulation of figures or data. The UZH therefore points to the conclusion of this investigation: no scientific misconduct could be proven for Prof. Mädler and Prof. Donath. Publications of the two authors, which were published at the UZH outside their employment, were not covered by this study”. 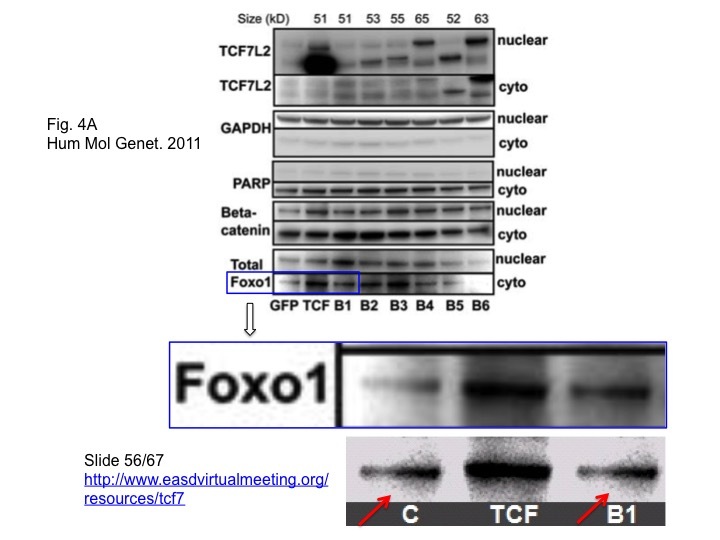 So apparently UZH did look at the evidence above, but found themselves unable to decide if what they saw was a duplication of western blot bands or not. They did discover for sure that whatever it was, it was not misconduct. Bodenmüller also explained to me why the investigation was kept hidden from the public: because it was an internal one. “After completing the investigation into the allegations of scientific misconduct brought to the attention of the Committee, the Committee finds that, in several cases Dr. Mädler has published a number of duplicated images and has repeatedly violated her duty of care in the organization of her working group over a longer period of time. In addition, she did not appropriately secure the storage of primary data on solid and secure media for all publications. Thereby, she acted negligently. According to § 1 paragraph 1 of the Regulations, however, “scientific misconduct” would require that, by means of the identified image duplications, Dr. Mädler would have made “deliberate or grossly negligent misrepresentations”. After a comprehensive and thorough assessment the Committee has found that there are not “sufficient indications” to provide evidence of deliberate or grossly negligent misrepresentations. The external assessment also concluded that so far none of the experiments has been refuted. On the contrary, additional controls were able to confirm the results”. We learn that figure panels and even individual western blot bands inside the same image can be duplicated utterly accidentally, and Maedler’s sole fault was of not noticing it. Because if the German star diabetes researcher did duplicate those bands herself, or tolerated one of her lab members to perform these manipulations, this would have been indeed “deliberate or grossly negligent”. The Rector of the University of Bremen, Bernd Scholz-Reiter, who is specialist in industrial logistics, has herewith discovered a unique quantum tunnelling effect of western blot bands which can appear simultaneously in several figures and publications. The next Nobel Prize in Physics must be given to Scholz-Reiter and Maedler, for discovery of western blot band trans-publication logistics. Who were the external investigators? Who performed the “additional controls” which “were able to confirm the results” and for which publications? For which publications exactly was the “primary data” missing? If we don’t know who external investigators are, how can we be sure it was indeed an external investigation, free of conflicts of interests, and not some shady internal whitewashing exercise in damage control? The last question obviously turns an academic publication, a piece of “paper”, into a legal person entitled to confidentially. Which possibly takes the German understanding of privacy protection a bit too far. We are informed that large pieces of original data are missing for Maedler publications, but it would be a break of personal privacy (whose exactly?) to incriminate any specific paper. As for second question, we know from Maedler herself that it was in fact her own lab which reproduced her own results so faithfully. However, in the eyes of the Bremen investigators this was deemed as an utterly independent and unbiased proof of reproducibility, because “so far none of the experiments has been refuted” inside Maedler’s own lab. Sure they weren’t. Help for millions, or millions for one? Maedler’s key discovery was hailed as potential cure for diabetes (and indeed, it led to clinical trials with thousands of patients, more on this soon). She and Donath postulated that high glucose levels in blood make pancreatic islet cells produce the cytokine interleukin-1-beta (IL-1β), which in turn activates the nuclear factor-kappaB (NF-kappaB) molecular pathway and leads to apoptotic death of pancreatic islet cells. The cause and potential cure for diabetes were found! But also Maedler’s career was made: she received many prizes and awards, like the €20,000 Ferdinand-Bertram-Prize of the German Diabetology Society in 2011 and the €60.000 Euro Paul Ehrlich and Ludwig Darmstaedter Prize in 2012. The funding money was raining: a 5-year start-up grant from the DFG’s Emmy Noether Programme in 2008, followed by €1.4 Million funding from the European Research Council, and since 2014, the (quasi-unofficial) Heisenberg Professorship funding. The seminal paper which made all this possible appeared as Maedler et al 2002 in Journal of Clinical Investigation (JCI) and was followed up by several publications from the Maedler and Donath labs, but you may have noticed that not a single diabetic has yet profited from that ground-breaking discovery 14 years ago. Why? Well, maybe because Maedler’s research is less reliable than Universities of Bremen and Zürich want us to believe. 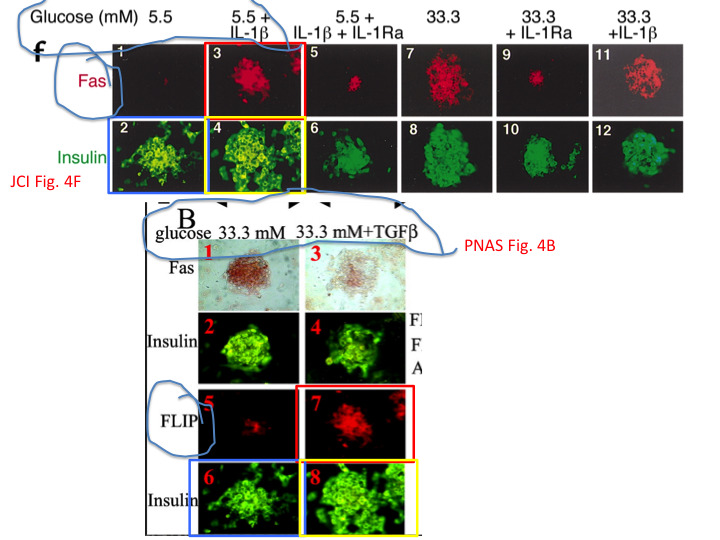 “The present findings suggest that high glucose in vitro, or the diabetic milieu in vivo, does not induce IL-1beta production or NF-kappaB activation in human islets”. „The publications in Diabetologia 2005 and Diabetes 2005 were not part of the investigative process. In 2005, Dr. Mädler was not a member of the University of Bremen“. So to Bremen investigators, these publications refuting Maedler’s key discovery became obsolete and irrelevant by the mere fact that they were published before she joined this university. Yet Maedler’s own attempts to reproduce her own 14 year old discoveries were hailed as confirmatory “additional controls”. Thus, what the Rector of the University of Bremen Scholz-Reiter, also discovered, was the concept of applied relativity of decay in research result validity. This would qualify him and Maedler for yet another Nobel Prize in Physics. The fame and reputation of University of Bremen is surely about to explode. The only administrative punishment for Maedler in Bremen was “an admonition by the Rector”. 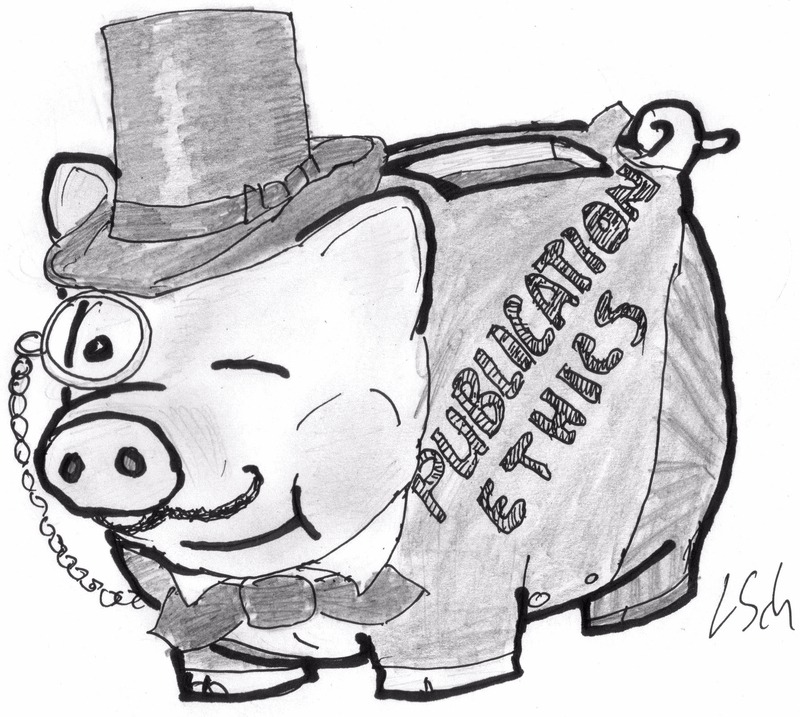 She was specifically instructed by her employer not to retract any papers, but to contact publishers about possible “Errata in consultation with the co-authors”. And it seems, most journals are perfectly happy to comply, or in fact to do nothing at all. The first evidence of image duplications in Maedler papers appeared on PubPeer in April 2014, meanwhile around 20 publications of her lab are under criticism. So far, there was only one retraction, of Ardestani et al 2011, justified by the reuse of images from other publications in a different context. 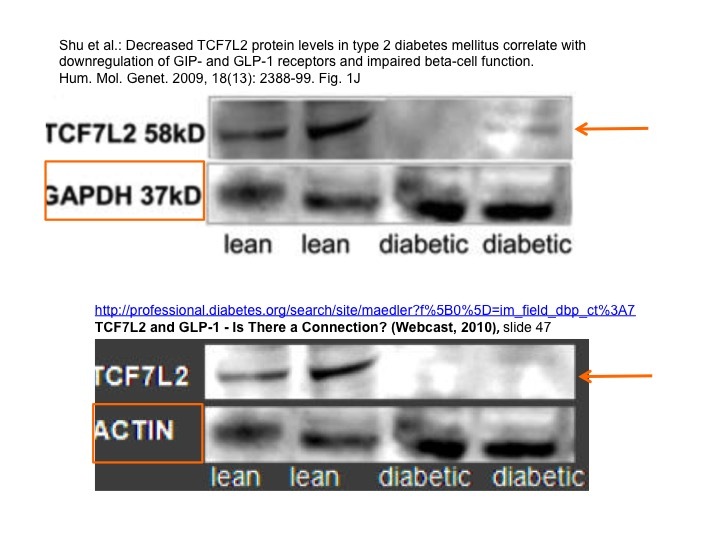 The journal Human Molecular Genetics corrected last year a Maedler paper Shu et al 2009, by replacing a western blot which contained bands from an earlier Shu et al 2014 publication in the journal Diabetes (that paper in turn was also corrected in 2014 and received in August 2016 an expression of concern due to additional “potentially duplicated images”). Meanwhile, additional PubPeer evidence of duplicated western blot bands emerged about the Shu et al 2009 as well as in another paper (Le Bacquer et al, 2011, PubPeer evidence here) from the Maedler lab in Human Molecular Genetics. “This has been investigated by the institution of one of the authors and the conclusion was that the data are fine after looking at raw data”. “Actually we do review raw data. Since this was being investigated elsewhere, we did not do more. We have worked with many other journals on this issue before”. the journal never saw the original raw data, never even asked the author or the University of Bremen to show it. the journal will not issue any corrections or retractions, even despite the blatant evidence as posted on PubPeer. “Please find attached the information from the corresponding author. This matter has now been resolved”. “Diabetologia takes all suggestions of scientific misconduct extremely seriously. All cases are investigated thoroughly by our independent Scientific Integrity Panel. We do not comment on individual cases”. This might sound serious and professional, but it means actually something else. 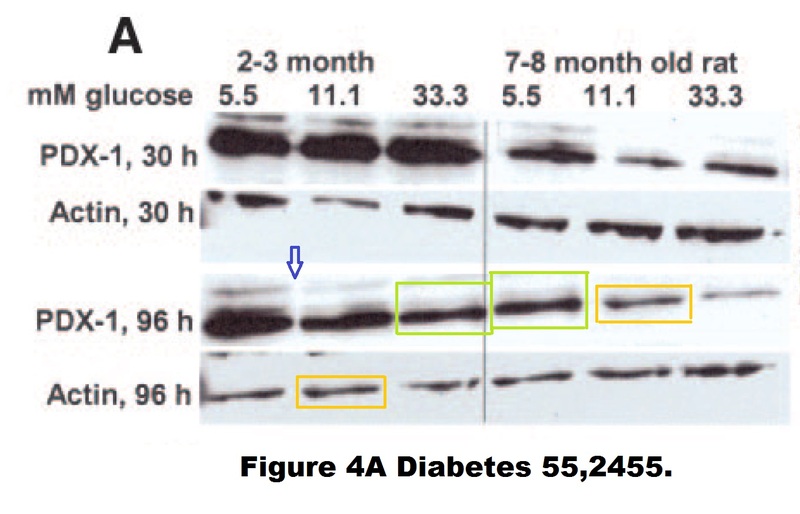 Regarding the case of the serial blot re-user and another diabetes researcher Mario Saad (see my reporting here), the journal Diabetologia was quoted: “our integrity panel has found no evidence of fraud or data manipulation”. Saad meanwhile retracted 8 papers for western blot duplications (obviously not from Diabetologia), which suggests that that tough-sounding “Scientific Integrity Panel” of that British journal consists of the famous three monkeys. I actually asked Naylor if this was the case, but received no reply. Thus, two respectable England-based journals made a decision to do nothing at all about the band duplications and the absence of original research data simply because the author’s employer said it was OK. The Editors-in-Chief didn’t even bother to ask to see the secret investigative report confidentially. If you needed yet another proof of the utter failure of scholarly journal-based academic publishing, here it is. 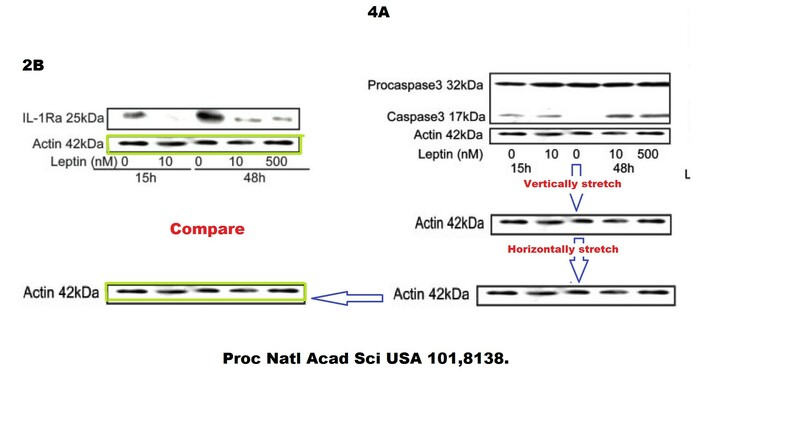 Both Zürich and Bremen university investigation tell us that “an unusually high number of image duplications” and cloned western blot bands can happen utterly unintentionally. Even combined with utter absence of corresponding original data, no research misconduct can be ever suspected, as the two universities keep hammering it into our heads. Finally, we must understand that any given scientific result is proven as 100% reproducible when its author insists that it is, regardless of any objective evidence to the contrary. We now live in a post-factual world, where any unsubstantiated claim becomes truth, if it is repeated often enough. In a follow-up story, I will report about the failed clinical trials supervised by Marc Donath, based on his and Maedler’s discovery of a potential cure for diabetes. Update 9.12.2016. Kathrin Maedler was found by the DFG guilty of misconduct and data manipulation in 6 publications and lost her Heisenberg professorship. See translation of press release here. Another example of (at best) sloppy practice is in your first figure above (Figure 1E from http://www.jbc.org/content/early/2011/03/10/jbc.M110.210526.full.pdf). Even I (as a relative non-expert in this field) know that tubulin is a cytoplasmic marker while histones are found in the nucleus. Nevertheless, the opposite is shown in the first figure (and in your header photo) above. In the published version (now marked as retracted) the lower two bands can be seen to be swapped compared to the early view version http://www.jbc.org/content/286/19/17144/F1.expansion.html. I don’t think we can tell when this error was noticed or by whom – did the reviewers fail to notice this or were the authors told to correct it? Whichever is the case, it shows the ease with which bands ostensibly from the same gel can be swapped around in figures without raising any serious concerns. On the basis of its review, however, ADA’s Panel on Ethical Scientific Programs (ESP) has concluded that the multiple confirmed duplications involving this article, one of which was introduced with the publication of the 2014 erratum (2), compromise the overall reliability of the data. Furthermore, the ESP has determined that such concerns regarding the reliability of the data cannot be sufficiently mitigated by publishing another erratum with another image; therefore, the Panel recommends to retract the article, and ADA has accepted this recommendation”.